The South Pacific: All palm trees and blue lagoons, right? Wrong! Oceania is the most ecologically diverse region in the world. I recently learned about one of Oceania’s hidden treasures, Milford Sound. Of course, it’s not really hidden. How could you hide a 15-km long fiord surrounded by 1,200 meter cliffs on either side? First things first: What is a fiord? The word comes from Norwegian, it refers to a long inlet with steep, rocky cliffs on either side. Fiords are geological phenomena formed millions of years ago by glaciers. Retreating glaciers cut large paths through hilly areas, leaving sheer walls of stone in their path. Milford Sound is known as Piopiotahi in Maori. It is found in the southwest of New Zealand’s South Island in Fiordland National Park. It was named after the Piopio, a tiny bird which is unfortunately now extinct. Milford Sound was one of the last parts of New Zealand to be explored by European settlers, who were intimidated by its steep and wind-swept cliffs. For local Maori, it was a treasure of fishing and hunting. But even the feared Captain James Cook found it so scary he named on of the mountain passes Doubtful Sound, wondering whether he would ever emerge safely. With as much rain falling as 10 inches a day, Milford Sound is the rainiest place in New Zealand. The combination of the rain and cliffs creates dramatic waterfalls that tumble into the water below. On a windy day, these waterfalls are so blown about that they flow towards the sky instead of the earth! This heavy rainfall also makes it a fragile and dangerous ecosystem. Visitors must be careful to avoid avalanches and areas washed out by the frequent floods that strike the park. 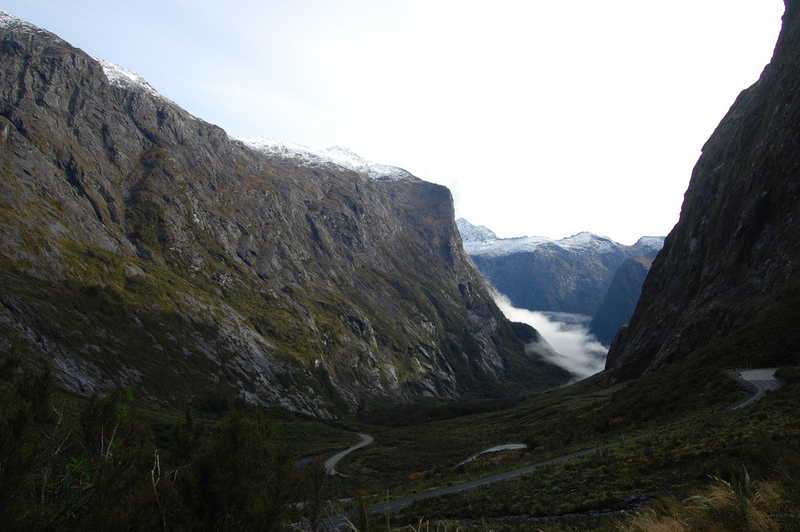 Today, Milford Sound is one of the most visited natural phenomena in the country. With so many visitors, the government is careful to protect this precious place. Despite the high demand, it remains difficult to reach from the nearest city. But trust me: You won’t regret taking the time to visit. There are daily tours leaving both Queenstown and Invercargill. Those with deeper pockets (and nerves of steel), might consider taking a helicoper tour through the sound. From the air, the towering cliffs are even more humbling! Sights of seals, dolphins and even penguins! The South Pacific is always full of surprises. I hope you’ve enjoyed learning about this one!